ePro Scheduler has been the choice for many EMS providers, fire and rescue departments, law enforcement agencies, ambulance crews, hospitals, and nursing homes to handle their scheduling needs and more. The software is designed to streamline and automate scheduling and other related processes and workflows, such as time tracking, shift management, time-off request and management, activity monitoring, and more so that employees are able to focus on their tasks. Working in the emergency medical services field or other industries of similar nature, it is critical that employees have certifications that qualify them for specific fieldwork. With ePro Scheduler, the system automates certification management and automatically prevents employees from clocking in or being placed on the schedule if their certifications have expired. This ensures the safety of the employee as well as decreases the liability of the employer. Boasting a user-friendly dashboard, ePro Scheduler makes it easy for users to navigate their data and see all the information they need to make smart decisions. Thanks to a centralized view, they can see who’s working and who’s not supposed to be in the field, who’s absent and who’s available to take his or her spot in the roster. Accurate time and attendance means accurate payroll. ePro Scheduler automates scheduling as well as time and attendance tracking, making it easy for the management to reconcile scheduled time to punch logs, verify time files, and precisely calculate an employee’s pay. What Problems Will ePro Scheduler Solve? 1) In emergency services like EMS and Fire, all shifts must be filled. If an employee calls in sick at the last minute, it is important to immediately find someone to fill the role ASAP. The shift page capabilities enable managers to easily notify that a shift is open and employees can quickly respond. 2) Most ePro Scheduler users adhere to strict certifications for fieldwork. Smart time clocks analyze employee certs and will not let them clock in if a critical certification is expired. 3) Many ePro Scheduler customers allow student riders. The student rider function in ePro Scheduler enables schedulers to delegate or give tasks to riders that don’t have the same requirements to work as actually employees with state and national certification requirements. If you are considering ePro Scheduler it may also be a good idea to examine other subcategories of Best Employee Scheduling Software listed in our base of SaaS software reviews. Each business has its own characteristics, and can call for a specific Employee Scheduling Software solution that will be adjusted to their company size, type of clients and staff and even specific niche they support. It's not wise to count on getting a perfect software that will be suitable for every business regardless of their history is. It may be a good idea to read a few ePro Scheduler reviews first and even then you should pay attention to what the service is intended to do for your business and your staff. Do you need an easy and straightforward service with just elementary features? Will you really make use of the advanced functionalities needed by experts and large enterprises? Are there any particular tools that are especially useful for the industry you work in? If you ask yourself these questions it will be much easier to locate a trustworthy app that will match your budget. 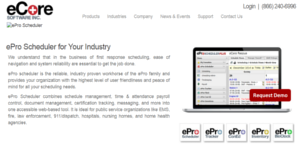 How Much Does ePro Scheduler Cost? ePro Scheduler’s SMB and enterprise pricing information is available only upon request. Contact the company for more details, and ask for your quote. We realize that when you make a decision to buy Employee Scheduling Software it’s important not only to see how experts evaluate it in their reviews, but also to find out if the real people and companies that buy it are actually satisfied with the product. That’s why we’ve created our behavior-based Customer Satisfaction Algorithm™ that gathers customer reviews, comments and ePro Scheduler reviews across a wide range of social media sites. The data is then presented in an easy to digest form showing how many people had positive and negative experience with ePro Scheduler. With that information at hand you should be equipped to make an informed buying decision that you won’t regret. ePro Scheduler	vs. Less Paper Co.
What are ePro Scheduler pricing details? What integrations are available for ePro Scheduler? If you need more information about ePro Scheduler or you simply have a question let us know what you need and we’ll forward your request directly to the vendor.